Patrick Seurynck, a victim of a recent auto wreck on Highway 82, hopes to have his Audi towed to Basalt High School for a presentation about seat belts. The front end of Patrick Seurynck’s Audi A4 station wagon is crumpled like an accordion. The windshield is shattered and barely holding together. The driver’s door is smashed to smithereens. Dried blood stains the interior.Seurynck sees it as a great teaching aid for a presentation he would like to make at Basalt High School. Even though he is still recovering at Valley View Hospital in Glenwood Springs from injuries he suffered in a March 8 accident, Seurynck is thinking of how to coax something positive from his horrific experience. He hopes to have the car towed from The Finishing Touch auto body shop to Basalt High, then make a presentation to students. 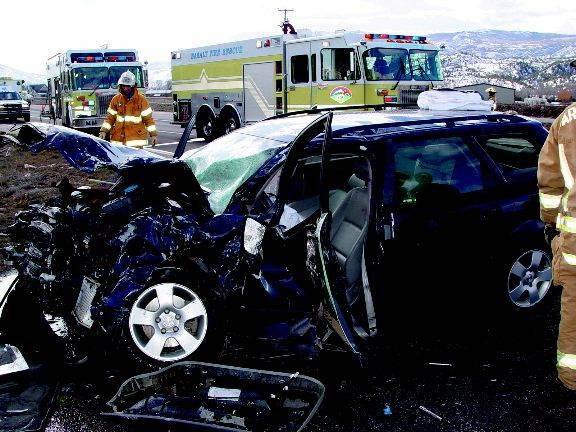 The message would be simple – seat belts save lives.Seurynck and his passenger, Joanie Haggerty, were traveling down Highway 82 in the midvalley the morning of March 8 when an accident unfolded right in front of them. A Toyota Land Cruiser crossed the median of the highway and struck a pickup in front of Seurynck. He couldn’t avoid a head-on collision with the Land Cruiser.”If Joanie and I weren’t wearing seat belts we wouldn’t be here today,” Seurynck said from his hospital room.The seat belt and air bags kept them in the passenger compartment, but they both were pretty banged up. Haggerty suffered a broken bone in her left arm, a fractured pelvis and a concussion. Seurynck suffered a broken left arm, a broken right ankle and a concussion. As the father of a 17-year-old son, Seurynck wants to share that message about seat belts with Basalt youth. Adults could also use a reminder. He said he knows of too many people who are lackadaisical about buckling up.He’s got the perfect visual aid to drive the point home. Seurynck said he envisions printing “Seat belt?” in crude writing on one of the remaining windows of his car. He would talk to the high school students about the circumstances of the accident and the injuries.Penny Paxton, the school resource officer for the Basalt Police Department, said she believes a presentation by Seurynck could be effective. Kids pay attention when there is carnage and severe injuries.There can be a “false sense of security” among youth and a feeling that nothing ever happens in a sleepy little town like Basalt, Paxton said. Seurynck’s experience proves otherwise. “You’re traveling down Highway 82 and in a split second this changes your life,” she said.